Employees of Wells Brothers and Panel Control Inc. enjoy breakfast in the plant in celebration of the company’s 30th anniversary, March 18. 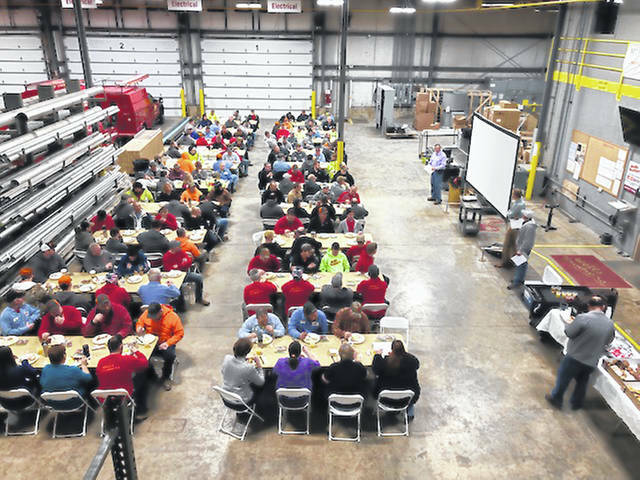 ANNA — The owners of Wells Brothers and Panel Control Inc. in Anna hosted a catered breakfast for its employees, March 18, to celebrate Wells Brothers’ being in business for 30 years. The breakfast of scrambled eggs, bacon, sausage, biscuits and gravy, potatoes, donuts, bagels and muffins along with coffee, juice and water was catered by the Spot. Curt Wells welcomed all of the employees by sharing with them a few details about when the business was started. The influence of teachers, who were mentors and deserved respect, the encouragement and patience of a neighbor, the late Bill Elsass, who gave Curt and Jerry a chance to work at his fabrication shop at a young age, and the discipline and hard work ethics instilled by parents set the ground work for Wells Brothers’ success. Wells Brothers, who incorporated in 1989, began in the home of Curt and Sandy Wells. Wells Brothers has seen many changes occur from 1989 to the present. In the early days, the scope of work was in the residential and farming electrical areas. The company is now much more diversified and offers its industrial customers electrical, plumbing and mechanical, metal fabrication, concrete and rigging capabilities. In addition to the change from the type of work done in 1989 came a change of where the work was done. In 1998, the firm moved from the basement of the Wells house to a 44,000-square foot facility built in Anna on Shue Drive. From the very beginning to now, one thing has not changed: the mission. “I will treat the customer and my co-worker as I would like to be treated” has been in place for the last 30 years and will be Wells Brothers’ mission as it continues to operate. https://www.sidneydailynews.com/wp-content/uploads/sites/47/2019/03/web1_30-Year-breakfast-group-photo.jpgEmployees of Wells Brothers and Panel Control Inc. enjoy breakfast in the plant in celebration of the company’s 30th anniversary, March 18.